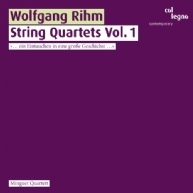 Wolfgang Rihm sets poems from Heiner Müller, Hermann Lenz and Rainer Maria Rilke to music. Listen to a living document about one of the most important lied composers of our time. In his Dis-Kontur and Sub-Kontur, the young Rihm strongly revolted against the emotional coolness he en-countered in the style of the musical avant-garde.